Do you have butterflies in your stomach or little deer jumping in your heart? This post was originally published on the Creative Multilingualism blog, and was written by Dr Marianna Bolgonesi. Here, Marianna talks about the issue of metaphors when it comes to learning a foreign language. A long version of this post is available here. Anyone who has learned a foreign language knows that some words are more difficult to master than others. This seems to be particularly true for words with multiple meanings, and specifically words that can be used metaphorically. But why? Metaphoric expressions vary greatly across languages, and they are often soaked in cultural habits and beliefs. 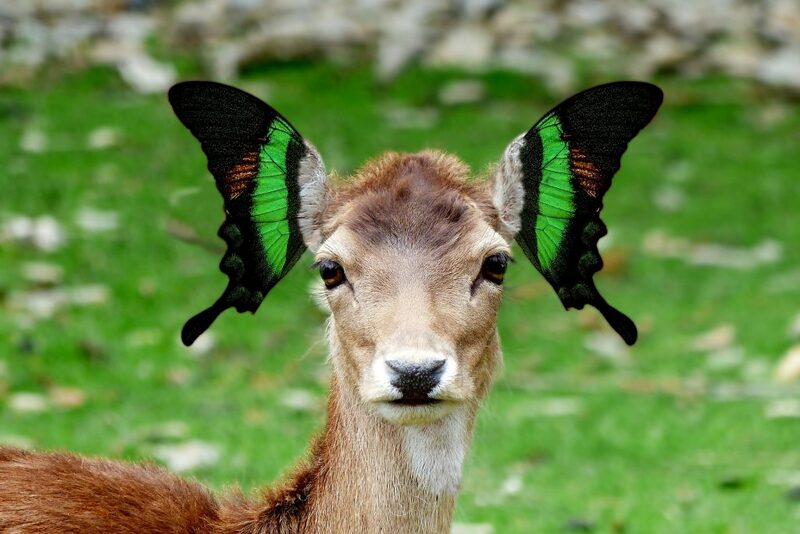 For example, while English people may have ‘butterflies in their stomach’, Chinese people will have ‘a little deer jumping in their heart’. Moreover, while some of these expressions trigger images that can help the learners understand the metaphorical meaning, others are less clear, and some seem to have no rational explanation: alarms go off when they actually go on, and houses burn up as they burn down! Is metaphor, a universal phenomenon across languages, a hallmark of human language? Is it possible to distinguish what is universal and what is language/culture specific in relation to metaphor? Why is metaphor a problem for foreign learners and how do language learners understand and use metaphor? These questions were explored in a discussion chaired by Dr Marianna Bolognesi with Professor Jeannette Littlemore (University of Birmingham) and Dr Linda Fisher (University of Cambridge) at an event in Oxford in February. During the debate it emerged how metaphors in language influence the way we think, and therefore, metaphoric expressions that we use on a daily basis can indeed be quite tricky for learners that have a different mother tongue, because they might think in different ways. If we look at how language shapes our world view, in particular when it comes to metaphoric expressions, we can see that while some expressions translate directly from one language to another, word by word, others do not. Consider, for example, ‘the statement it’s raining cats and dogs’, a classic idiomatic expression (a specific type of very conventionalised metaphor in language) that we use to say ‘it’s raining a lot’. In other languages the image of cats and dogs is quite different: in Catalan it rains barrels and casks (Està plovent a bots i barrals), in Dutch pipe stems (Het regent pijpestelen), in Irish Gaelic cobblers’ knives (Tá sé ag caitheamh sceana gréasaí) and in Norwegian female trolls (Det regner trollkjerringer). These various ‘entities falling from the sky’ are probably related to cultural traditions and experiences that are typically shared by the communities that speak these languages. These expressions are therefore very different from one another. However, they share an underlying common trait: all of them are quite unpleasant when falling from the sky, as well as unexpected, and heavier than normal (literal) rain. All of these common traits constitute the core, underlying meaning of these metaphoric expressions, which is related to our bodily experiences with heavy rain. These bodily experiences, at the very basic level of perception, are not that different across languages and cultures, because we are all humans and share similar bodies. Even within the same language, for example English, it is possible to come up with creative variations of conventional metaphoric expressions. Urban Dictionary, for example, has an extensive list of alternatives to ‘It’s raining cats and dogs’, including ‘it’s raining pitchforks’ and ‘it’s raining like a cow peeing on a flat rock’. In the second half of the debate we focused on the problems that metaphors cause for foreign language learners, and the solutions proposed to overcome these problems. On the one hand, metaphors can indeed be problematic for learners, because learners tend to process linguistic input word by word, and translate word by word what they hear in a foreign language. However, metaphors, as already discussed, do not translate word by word, most of the time. Moreover, learners often do not realise that they have not understood the intended meaning, and this can cause additional problems in the classroom, because they give misleadingly positive feedback to the teacher (‘yes, we understood everything!’). It seems therefore crucial for the teacher to be very careful when using metaphors in the target language and to double check with the students how they have interpreted the metaphor. Metaphors, on the other hand, can also be a very productive tool when used in the classroom to express beliefs and conceptualisations that students may be more willing to share through metaphors than through literal (and often quite abstract and difficult) language. In this sense, metaphors can help the students to embrace a creative way of thinking and talking, putting aside their fear of making mistakes, and conveying messages in a way that better reflects their personal, cultural and social identity.